So I've been working for a while(10,000+ lines of code and counting!) 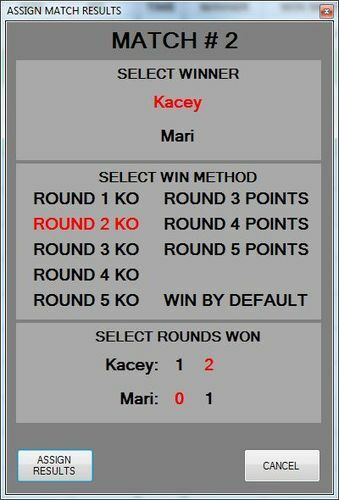 on a custom, windows based, program to help manage a Jab tournament and I was wondering if anyone else would be interested in it. Here is some information on what I've created so far. The tournament is designed to use the standard Jab rules and just runs a double elimination tournament. The program currently can support a player count from 10 to 26 players. 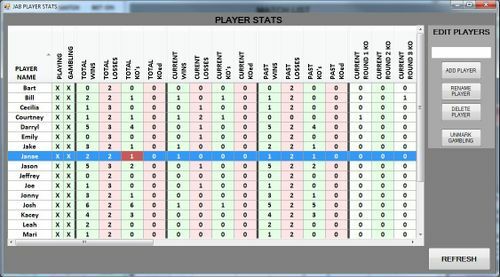 In addition to that it keeps track of player statistics in order to "calculate" odds of a player winning / losing the match. These odds are then used for people to place "bets" on competing players. There is no limit to the number of people who can place bets. 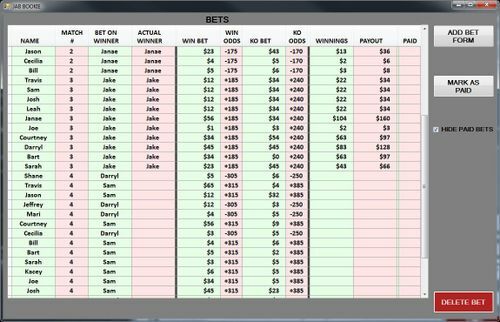 The program keeps track of the bets placed and the money won / lost from each match. 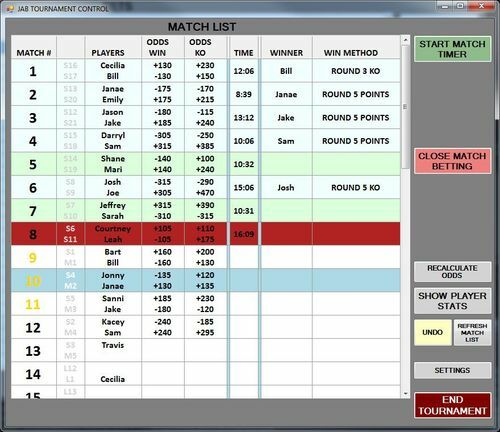 From this mode the tournament is controlled, including adjusting settings that control how things operate, starting / stopping match timers, opening / closing betting for the matches, and assigning the results of a match. 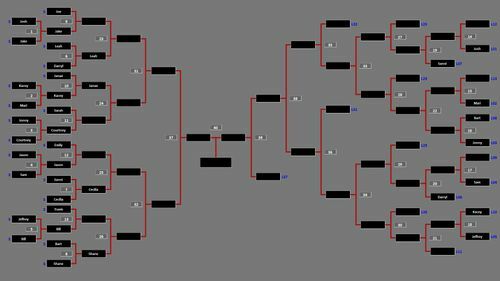 This mode opens up full screen and displays a graphical representation of the bracket. I plan on running this on a projector, but it can be on any computer monitor that people can look at. The graphics automatically update as the tournament progresses. The tournament control program can adjust the colors of all the elements on the display. The display also cycles through three displays: Bracket display, Match list display, and stats display. This mode allows someone to take bets from people or hand out money won from bets. 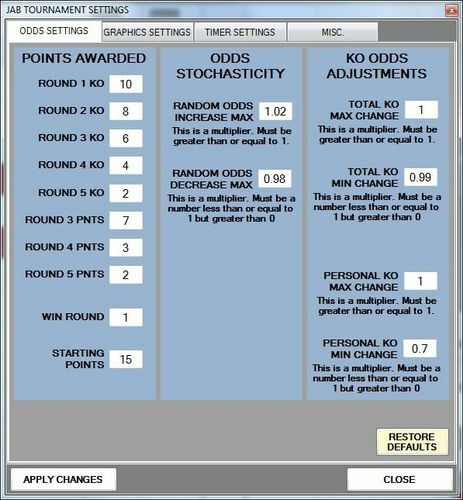 The form is automatically updated by the control program with odds calculations, money won / lost, etc. The control program also can open / close betting for each eligible match. 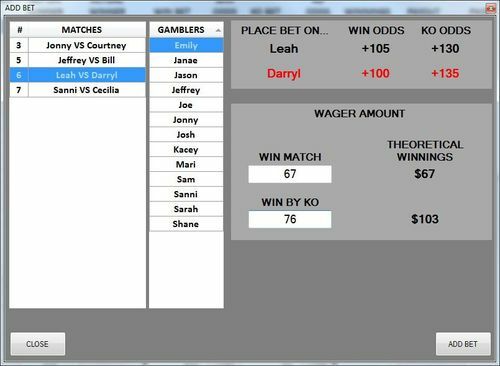 This is the add bet form and it auto populates with eligible matches to place bets on as well as people who can place bets. All of this information is dynamic and updates as the tournament progresses, making it easier to manage everything. The program is designed to only be running once in control mode, but can have any number of display or bookie modes running on any number of networked computers(or even the same computer). This way you can have multiple computers that people operate to take bets or hand out bet winnings. They all coordinate and communicate together. The reasoning for this modular approach is past tournaments have had a bottleneck when placing and receiving bets. 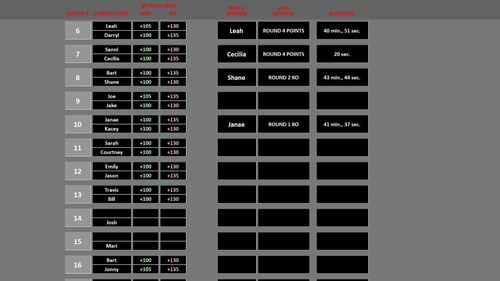 I had a single excel spreadsheet with vba running the tournament and EVERYONE wants to place bets for the matches, which means a LOT of bets to take and money to hand out from a single computer. This way I can have multiple people take bets or hand out winnings as necessary for the size of the tournament. Note: When I say "bets" or "money" I am talking about fake money that we use. I would not recommend real money unless you like losing a lot. The odds certainly or not in the bookie's favor. This element is just for an added dimension of fun. So yeah, this is what I have created. It is 98% finished, just a little rough around the edges right now and not super user friendly. I wasn't even sure if I would release it to other people or if there was any interest at all. Let me know what you think!